I desperately wanted a great place to train but the drive was killing me – up to 90 minutes each way in traffic – not my idea of fun. And my dream seemed so far away – to create my own club was going to be a big challenge, a heap of work and then of course I’d have to make it work as a business. The other option was to quit karate altogether – but after 15 years I just couldn’t do that! 3) I’d just moved to a new country and had no credit! This was going to be a tough one! When I moved to the USA from Australia, I decided right then and there that I would make it on my own – no matter how tough things got financially I wasn’t going to do the 9-to-5 thing any longer. I’d already been in a high-paying I.T. job and really liked the cash, but despised the 60-70 hour work week and virtually no weekends. I came to the opinion that “real jobs” were over-rated. And I decided that I wasn’t going to work for anyone else ever again. 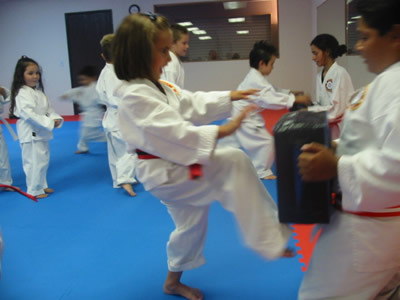 I was going to build a karate school from the ground up and do what I loved doing, but do it for a living – karate! That was almost 3 years ago. It took me about 18 months but I got there – with a lot of help and support from my wife, family and friends. 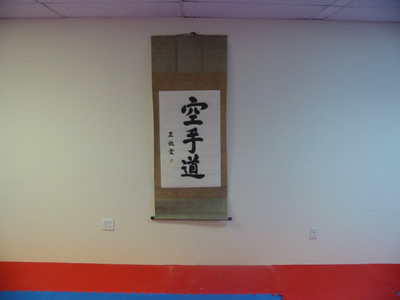 In September 2004 I opened my first full time dojo – now I work 3-4 hours per day doing what I love. The pay isn’t as good (yet) as my high-paying I.T. job of 3 years ago, but I have no commute, 10 times less stress, get to sleep in if I want to and spend most of my days having fun! Now I’m not telling you this to get under your skin – if you’re a full time instructor, you’ll be familiar with the lifestyle – however, if you love karate and hate your full time job it’s something for you to think about. Perhaps you too could begin your own school? For now I want to pick up the story 18 months after I started teaching here in the United States. 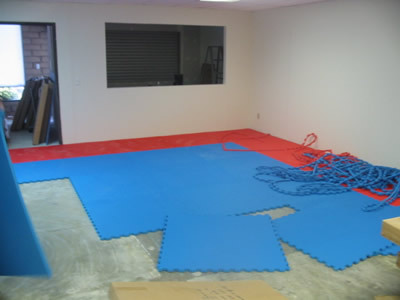 Specifically I want to show you how we transformed an auto-customizer’s sludge pit into a full time karate dojo – I’m sure you’ll get plenty of great ideas and my hope is that you’ll feel inspired to take the leap of faith yourself (when your time is right) because the rewards of having your own club are fantastic. 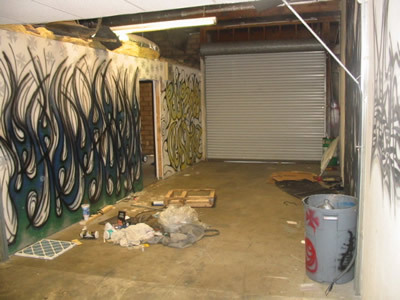 Here’s a picture of the club when I first took on the lease. 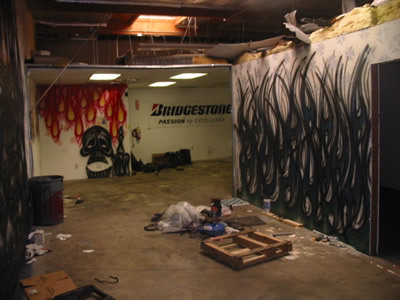 Notice the lovely skull and bones spray paint and the state of disarray the place was in. A friend and student of mine, John, is the manager of a group of light industrial businesses – including the space I took over. Yes – you heard right – it’s in a light industrial part of town – not the ideal place for a karate club but it is working out just fine. The benefits of the area that I’m in is that the rent is 50% of what it is in the retail parts of town, so moving from the community center where rent was even less, to a place that was asking 3-4 times the rent (a retail shop front) would have been impossible. I would have had to put the monthly training fees up 3-4 times to cover the expenses. How many students do you think I would have retained? Important point – While everyone wants the grand scale school in the nice part of town, unless you’re cashed up or suddenly enroll 200 students in one week, you have to start where you’re at; start off with what you can afford. It’s the law of growth! I managed to find a landlord who only wanted a 12 month lease. Plus the rent was so inexpensive, comparatively speaking. 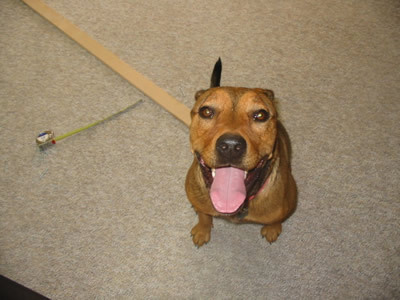 It was a jump of only a couple hundred dollars from what I was paying at the community center…so it was a no brainer! 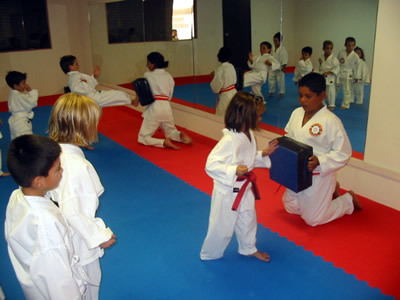 I was then faced with the challenge of moving my students from their karate home to a new place. I also had to put the monthly fees up 50%! Guess how many of my 70 students I lost in the move? Three – all from the same family. I retained 67 out of 70. That’s a 95.7% retention. Now the trick to not losing or upsetting everyone was to include them in the decision making process. I surveyed all of my students and parents and offered them all the benefits of a full time club. I told them that I had an opportunity to give them better service, more classes, a reduced cost per class (even though fees were going up 50%), and a safer training environment in a purpose built studio – the ‘catch’ was that they had to tell me right then and there if they would support the move, as there was no way I was going to sign a lease without their support. I made it THEIR decision – not mine. Thanks to all my loyal students and their families, I signed the lease the next day and 3 days after that I was given the key! Yes – there was a lot of work to be done. The previous tenant skipped town and the landlord had 6 people wanting the building – so I had no choice but to volunteer to clean up the mess and move in immediately even though I wasn’t ready to move for another 3 weeks as I was contractually bound by the City. My buddy John helped out big time. For the next 3 1/2 weeks we worked day and night (except when I was teaching karate), doing demolition, construction, painting, electrical work, etc. Some days we had the help of my wife Christina and her side of the family, plus a couple of other students and friends. It was a huge job. 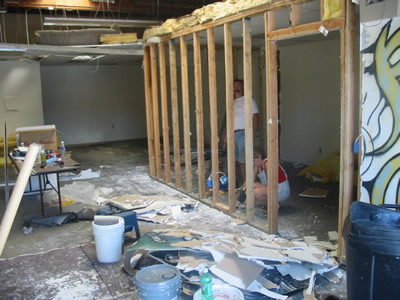 First came the demolition…that was the fun part! We knocked down 3 walls in about 30 minutes! Oh man what a mess, but certainly better looking than the graffiti. 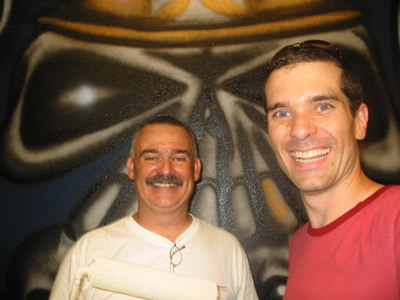 Here’s a picture of another student and friend of mine, Mike, lending a hand. 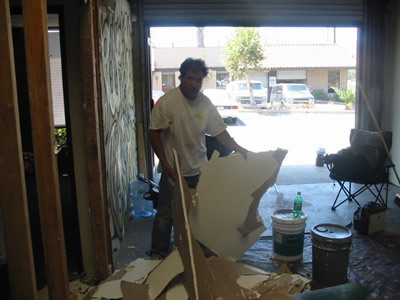 Once most of the major demolition was done and all the trash taken out we started painting. It took 6 coats of thick white paint to cover the skulls and flames. And yes I even got a little dirty too – not just taking photos all day long. 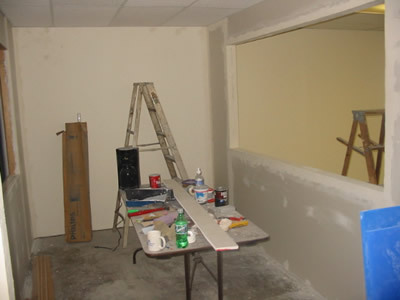 The picture below shows half of the painting done, but still no ceiling in 50% of the building. If you’ve ever put up a false ceiling with just a bunch of hooks and wires (without the professional tools) you’ll know how difficult it can be. 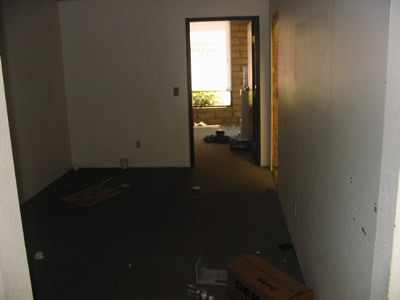 It took forever – partly because we had to take down all the auto parts the last tenant had stashed up there – but mostly because I had little idea about what I was doing! Now you’ll notice that the picture below shows the front roller door – yes roller door. I had to come up with a way to make it feel like a dojo and not like a factory. There was no way I was going to have parents sitting in a factory watching their kids – that’d be the end of my school. The answer was easy – well in theory it was easy. We built a wall on the inside of the door and put in an 8×4 Plexiglas window. Now, when the club is open for business we roll up the door and people outside can see in. From outside you really can’t see that it’s a factory building. It looks like a shop front with a large sliding window and a waiting room on the inside. 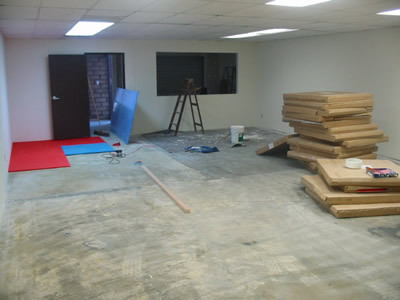 Below is a picture of what now is the waiting room. It’s 8.5 feet wide and has space for about 8 chairs. 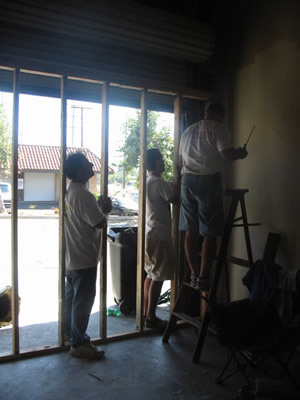 As you can see we built another wall on the right with space for another 8×4 Plexiglas window so parents and people wanting to watch the class can see without disturbing the class in progress. The front of the building is to the left, while the tatami is on the right. Here it is after the paint… looks small I know – and it is – but it comfortably sits 8 adults, a shoe rack and a coffee machine. In the room where I took the photo, I have another 8 chairs, table and water cooler – there is plenty of room for spectators. The picture below is taken standing at the front door looking in. The waiting room above is to the left of the area pictured below. 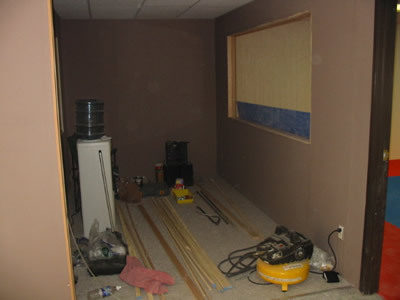 This next picture is looking from the waiting room/reception through the window space to the tatami – after we’d put in the false ceiling. Important! When dealing with layers of fibreglass insulation, make sure that you were protective eyewear, long sleeves and a dust mask – fibreglass isn’t a nice thing to inhale, get in your eyes or on your skin. It itches like you wouldn’t believe and is difficult to wash off. 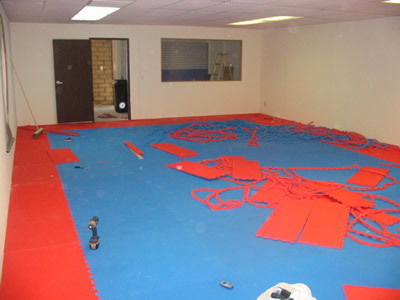 The picture above is looking back the other way towards the reception on the left, waiting room on the right, and the one below shows what it looked like before the mats went in. Here’s another rare shot of me doing something other than taking photos. 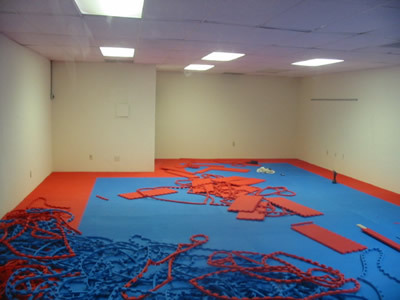 It took me a few hours to lay the mats. I had to cut around the bathroom and cut all the mats to fit along one entire side of the tatami. 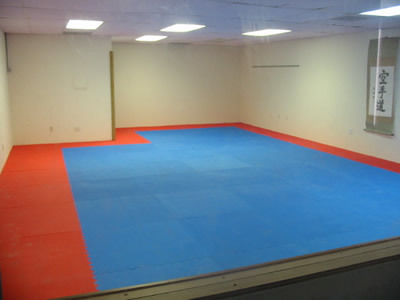 The tatami isn’t huge – it’s about 22 feet wide (6.7 metres) by 41 feet (12.5 metres) in length. That’s around 900 square feet in floor space. Plenty big enough to fit in 12 – 15 kids or about 8-10 adults. 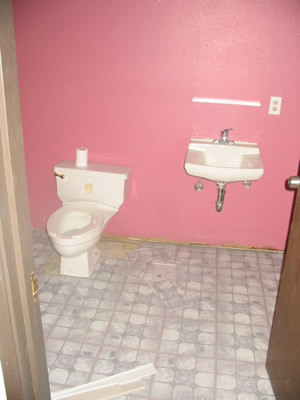 We even had to tile and paint the bathroom. The paint is my favorite color – FREE! It was donated…thank goodness for donations – even if it means pink paint. 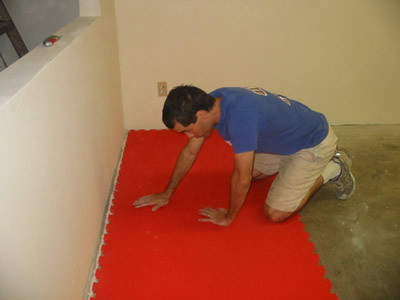 When I ordered the mats I got a great deal – wholesale price. Here’s a great tip for you – be sure to open an account directly with an importer, not a martial arts supplier or you’ll pay through the nose. I was expecting to pay about $20 USD per mat, but picked them up for about 1/2 that price! What a bargain. I also saved $300 in delivery by actually picking them up myself rather than having them delivered. No club is complete without the kanji! 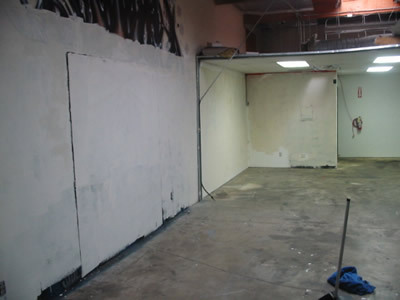 Below – the first picture of the transformed auto-customizer’s sludge pit… just 3.5 weeks from beginning to end. And finally it happened – opening night. The students loved it! 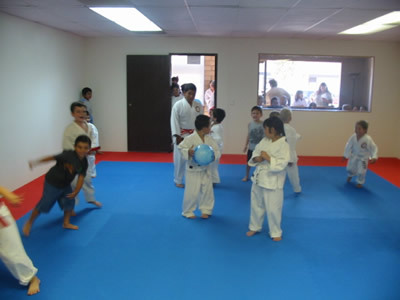 Here’s some of my PeeWee class losing their minds over the new mats and mirrors. Here’s a picture of a few PeeWees beating on some of my Junior assistants. 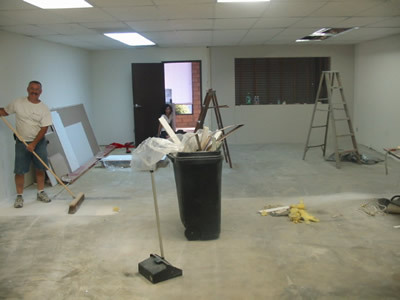 It cost almost $2,000 not including labor, and 3.5 weeks of solid work to transform the club. Yes, I know a lot of money – that’s if YOU have to pay for it. Notice I said it cost $2,000 – not it cost ME $2,000! During the 3 weeks that we were building we held a fundraiser and the kids raised over $1,200! How did I get my kids to work so hard to raise money? Easy. I offered an incentive. I had to think of something that would get the kids to work hard, had great value for them but wasn’t going to cost us an arm and a leg in the process. After thinking long and hard, my wife came up with the perfect idea. The 2 children who raised the most money won a day with Sensei at Chuckie Cheese’s (a kid’s Pizza & Video Game Parlor) with 150 tokens each! Had we had more time, perhaps we could have raised more cash but it just shows you that with a little creative thinking and a lot of hard work, a dream can truly become a reality! Someone else setting the hours for when I had to teach – now I teach when I want. Having our premises randomly closed for renovations, public works or rentals – now we don’t get shuffled around any longer. Younger brothers and sisters running across the floor during class – now we have a sound proof wall and reception where younger siblings can play without disrupting the class. Limited in what I could teach because of the concrete gym floor – now we can fully perform takedowns, throws and ground fighting without fear of injury. Slow development of students without mirrors – now students can visually assess their technique and make changes themselves, improving their skills more quickly and allowing me to teach rather than constantly correct. Anyhow, that’s that. Thanks for sticking with me this far. I hope you enjoyed the transformation as much as we did building it. I also hope that if you’ve been teetering on the edge, this pushes you towards making your own club. It is completely worth the effort, even if it seems a little overwhelming when you’re not sure where to begin. Remember that I started with nothing less than 2 years ago – now I have 90 active students (and growing) with a plan to double that base within the next 12 months. Here are the key points in summary. 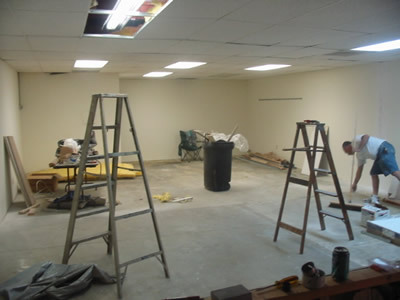 Ask & accept for any donations monetary or material – paint, mirrors, labor, etc – you’ll be surprised at how many will be willing to help. Do a fundrasier to cover the start up costs. We were able to keep 30% of our fundraiser sales – if you need a good fundraiser contact me. Don’t be afraid to start up in some place that’s less than your dream location – remember take it in baby steps.